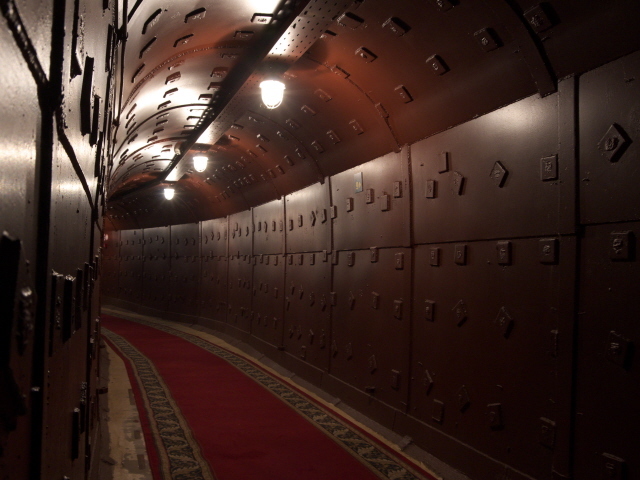 A unique and rather strange attraction in Moscow, Russia: a former nuclear bomb shelter and command centre from the Cold-War era, deep underground and connected to the metro system. Since being decommissioned and sold to a private enterprise it's been turned into a cross between a Cold War museum, underground theme park and entertainment and event space. Guided tours in English are available, but they are quite expensive. No wonder verdicts about this place vary wildly. More background info: It's actually not so easy to get hold of reliable background information about this place. That's not so surprising, given that it was of course a secret installation back then. Construction of the bunker system was begun sometime in the early 1950s, using methods also utilized in the building of the metro, with tunnels dug, supported by steel ring tubes, some 65 metres underground. By the early 1960s the complex, which went under a whole host of different code names (including GO-42, from which the site today obviously took its name), had been equipped with life support systems, communications gear, air purifiers and even two deep wells for providing drinking water. Its main function seems to have been to serve as a command centre for the Soviet Air Force's fleet of long-range nuclear bombers, though the guide on my tour made additional claims that it was also connected to the Kremlin and was used for emergency top-level meetings during the Cuba Crisis (but I have my doubts – see below). Regular staff would have arrived through the metro system, though at night, as the complex was connected to the nearby Taganskaya metro station. Obviously there were several checkpoints and blast doors to pass before arriving at the various positions inside. Apparently there was space for up to 3000 people down here. Today the connecting tunnels to the metro are blocked. Instead access is through one of the secondary/emergency entrances down a vertical shaft with stairs going down 15-18 storeys. The house at the top of the staircase is a fake residential building camouflaging a concrete “dome” above the shaft that is said to be some 20 feet (6m) thick. At the bottom the complex consists of four wider steel-ringed tubes called “blocks”, connected by narrower tunnels and with side rooms for equipment and supplies storage. What exactly went on down here, however, can only be speculated about. Whatever it may have been it seems clear that by the 1980s the complex had basically become redundant. It was kept under military control but a large proportion of the original installations were already taken out. There may also have been a problem with water leaks. The complex was finally decommissioned either in the mid 1990s or early 2000s, i.e. after the Cold War had ended anyway. It was then auctioned off and sold to a private company in 2006, which turned it into the visitor attraction and entertainment complex it is today. Apart from serving as a kind of “Cold War Museum”, part of its portfolio seems to be to cater for contemporary wealthy Russians' Soviet nostalgia. For serious money they can have extended tours, private performances of military bands and choirs and banquets in the site's restaurants and function rooms, all adorned with plenty of faux Soviet symbolism (think red stars and vintage propaganda galore). In addition it seems to have a mission of “military-patriotic education”, offering special tours for youngsters who can get “basic military training” and learn to disassemble and reassemble Kalashnikovs. I'm not sure what to make of all that. But anyway, for international tourists the bunker is primarily for the regular English-language guided tours, of only part of the complex, as described below. What there is to see: I had read ahead in various online reviews, so I knew that the rule that you have to arrange a visit over the phone ahead of time was not strictly speaking applied in reality. So I too risked it and just turned up in time for the regular English-language tour at 1:30 p.m. – there were already several people waiting who also hadn't made any arrangements. But eventually we were let in and were able to purchase tickets on the spot. The guide turned up in a green mock-uniform-like attire with a black tie and most of the time wearing a grim frown (put on, of course). He spoke a few introductory words before the tour as such started. His English wasn't flawless but OK.
Before we descended the staircase to the bunker a few basics about the place were pointed out with the help of some diagrams and maps on the wall that showed the layout of the underground complex. Then the group started the walk down the stairs. I can't remember whether it was 15 or 18 storeys, but it sure was a long way down. At the bottom we regrouped and the tour continued. 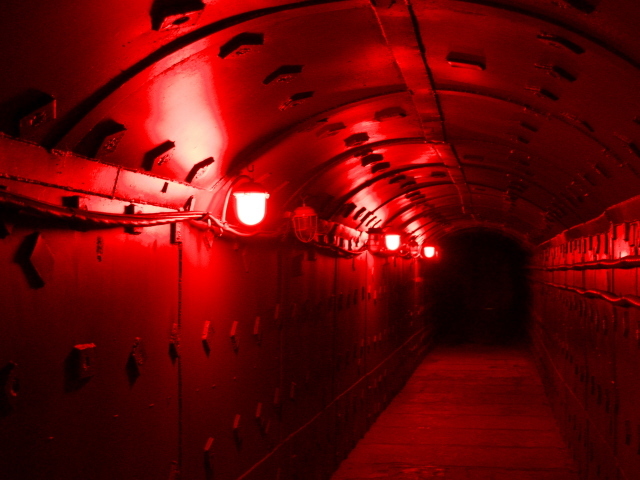 First we proceeded through a long narrow tunnel clad in metal and painted a dark brown. The floor was covered with a red, living-room-like carpet. I doubt this would have been the original interior design back in the bunker's operational days. We stopped at a checkpoint, where some old communications gear was on display and were given a short narration of what the access procedures would have been like back in the day. On the wall was an info panel listing and describing other similar sites around the world (including the Greenbrier, the Churchill War Rooms, the Titan Missile Museum, Marienthal and others). Next we entered “Block 4” of the complex, through some heavy steel doors and yet another checkpoint. A first installation supposedly illustrating the atmosphere in the bunker consisted of a dummy secretary “typing” something on a vintage teleprinter-type machine surrounded by yet more old technology and a steel filing cabinet. A mannequin soldier stood guard in a corner. By the way, a real person (a guy in a suit) always followed our group at a discreet distance – obviously to rake in any straddlers, since the group is supposed to stay together at all times and nobody is allowed to go off exploring on their own. The space inside Block 4 is considerably bigger that in the connecting corridors and is lined with heavy steel rings just like a Moscow metro tunnel. In fact, it's high enough to accommodate two levels. And it was up some stairs, built like a metro escalator, but not moving (but featuring lamps just like in the 1950s metro stations), past yet another dummy guard sitting at a desk, we proceeded to an upper level. Here it got properly bizarre. There was a long stage-like wooden platform raised about a yard above the floor, with parquet floor and wood-panelling along the walls. A heavy leather sofa stood in the centre, a table with chairs and a chessboard to the one side and a big desk to the other. At the latter sat a dummy Stalin staring contently into space in front of a Lenin portrait on the far wall and a Lenin bust in front of him on the desk. From the ceiling were hung several delicate chandeliers, providing an odd juxtaposition with the heavy steel ceiling. All these interiors are obviously fake and just there for effect. 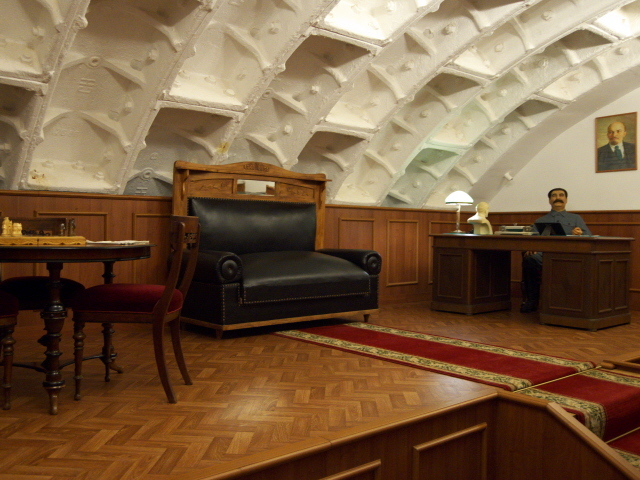 Stalin had long been dead before the bunker became properly operational and it is more than doubtful that he would have been given such a plush office (on a stage!) here, when this was an Air Force command bunker (and anyway, Stalin had his own bunker elsewhere). The next room was also a bit dubious. Also on the upper level, under the low curve of the steel frame, a long conference table stood together with a good two dozen chairs all covered in a white protective cloth. On the table several scale models of Soviet long-range bomber planes were placed. 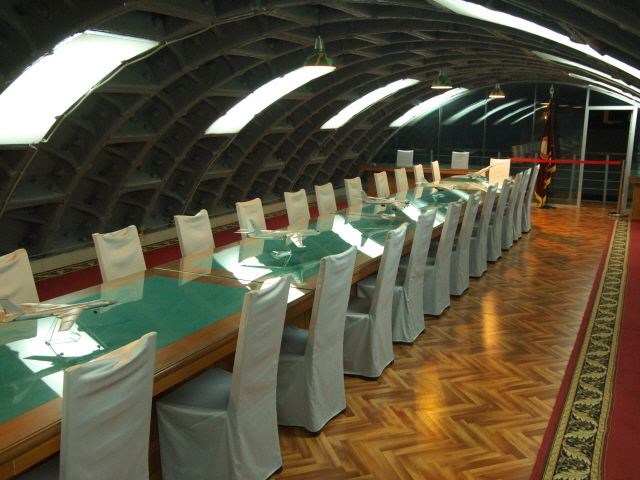 Our guide claimed that this was the actual room in which the Soviet authorities sat together during the Cuba Crisis. Well, the bunker may have been on high alert at this time, but given that the Cuba Crisis was primarily one of missiles and the navy, I doubt that this place would have hosted any of the serious shot-callers in that crisis. I'm pretty certain that Khrushchev stayed in the Kremlin. But never mind. It was then time for the “highlight” of the tour. This was in a hall with a single level, and hence a very high ceiling. Again there was a kind of stage area to the left. In the centre of this stood a mock-up of the RDS-1 device, the USSR's first nuclear bomb (which was tested at the Polygon in 1949). Amusingly, one of the kids in our group was quite spooked by this and asked if it was at least “unarmed” … so our guide admitted that it was just a model. Several smaller scale models of various Soviet-era missiles/ICBMs were on display too on a nearby table, illustrating the progression in the development of that type of weapon. The main thing here, however, was the film projected onto a screen on the wall at the far end of the hall (no videoing allowed, even though it was all well familiar stock footage, mostly of American origin) followed by a “simulated missile launch”. This is an element similar to the highlights on the tours at the Titan Missile Museum and the Ukrainian equivalent at Pervomaysk, but here it really lacks authenticity. Not only was there never any real missile launch centre at this bunker and the mock-up they put here for effect looked dubious in parts too. For instance, there were computer flat-screens at the two desks – and I very much doubt these would already have been available during the Soviet era. Anyway, two group members were selected to sit at these desks (that same previously spooked kid being one of them, now getting very enthusiastic) and they were talked through a mock launch procedure involving several synchronized key-turnings, entering codes and pressing buttons, all accompanied by “dramatic” sound effects. Beyond this large hall I could glimpse through a doorway and saw some glass display cabinets with uniforms and other objects and I guess that would have been the exhibition part that I had read about (where apparently you were not allowed to take photos, and all labels and texts were in Russian only with no explanations in English given …) but we did not head there after the “launch show” but proceeded back up some stairs. Maybe they only include this exhibition part of the bunker on the Russian-language tours these days. I don't know. 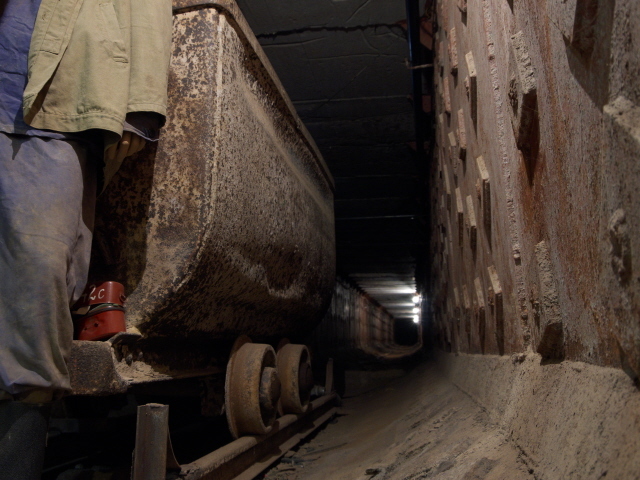 On the rest of the tour we saw some of the dormitory rooms and part of the technical equipment, as well as the “end of the tunnel” as it were – a mock-up of tunnel-digging with dummy miners and their gear and a fenced-off part of tunnel leading into the darkness beyond. Some panels further illustrated how the bunker was built. As a final show element our guide went through a “red alert” show, first turning the lights off – so that we all stood in complete black darkness for a few moments – followed by some flashing red lights and yet more rumbly sound effects. Apparently, tours varied a bit in content in the past (and possibly still do). Not only did we not see the exhibition part next to the mock launch centre, there was also only the one shortish film, whereas I'd read reports from earlier tours talking about more than one film and choices between different versions and lengths. Some also saw more of the support technology than we did on this tour. I don't know whether things changed or still vary. Anyway, you have to take the tour as it comes in any case. For us that was it. Participants then had the choice of making their way back up all those (288!) stairs to the surface, which most did, or of staying behind to pop into the restaurant/bar area for a bit. I had read in online reviews that the latter makes sense even if you aren't having a full meal at the restaurant and only stay for a quick drink. That's because the great advantage is that this way you are allowed to use the lift back up. It's small, taking no more than perhaps 4-6 people at a time, so that's why they don't offer this to whole groups – except for those who have mobility issues – but for just a couple of restaurant/bar patrons they do allow it. The restaurant/bar area is definitely worth seeing too in any case. Not for any authentic bunker atmosphere, mind. On the contrary. These are the parts used as an entertainment/event space, full of coloured lights and kitschy renditions of Soviet symbolism and mock propaganda designs. There's a stage in the main restaurant with a monster sound system, so you can imagine what the party atmosphere down here must be like when things really get going. When we went there it was quiet, though, just two tables occupied, the stage empty and just a screen playing some movies in one corner. Some people who had been on our tour actually sat down for a meal, but my wife and I made do with a drink at the bar, before taking our leave and heading back into daylight. Finally, both at the ticket booth topside as well as at a stall down by the restaurant part you can purchase some souvenirs, such as plates with Stalin portraits on, fridge magnets, coffee mugs and the like. All in all, I can see why people come out of this place with such widely diverging impressions. Some dismiss it all as a stupidly overpriced, ludicrous tourist trap. Others are really smitten with all the Cold-War-era and Soviet retro/nostalgia elements, including the missile launch “simulation”. I'm somewhere in between. Some of the theatrical elements didn't convince me either, and I have my doubts about the truthfulness of parts of the narrative presented. But it's still a cool place to see, especially if you can tolerate or even enjoy some of the kitschier elements, which I found quite hilarious. So in short: if you can deal with the hefty admission price, and are prepared not to take the whole thing all too seriously, then it can still be recommended. If you're after a serious, sober, accurate history lesson and complete authenticity, then you may be disappointed. Use your judgement. Location: to the west of the city centre, but near the Moskva River, in the Taganka district. Address: building 11, 5-y Kotelnicheskiy pereulok, Moscow, 115172. Access and costs: restricted, by guided tour only; expensive. Details: Nominally, you are supposed to book a tour in advance over the phone ( +7 (495) 500-05-53, or 500-05-54), but you can also just as well turn up in time by the gate and try to get on a tour on the spot. That's what I did and it worked fine. But if you want to make absolutely sure you can get on the English tour, then by all means do phone ahead to avoid later disappointment, as places on the tour are limited to a maximum of 50 participants. Getting to the entrance was also nowhere near as complicated as some older online reviews had made me believe. In fact it was dead easy. I just walked down from Taganskaya metro station to the bottom of the square, turned right into Goncharnaya ulitsa and then by the little church turned left into 5-y Kotelnicheskiy pereulok. Soon after I saw a big red Bunker-42 sign with a red star at the top of the façade of the building with the entrance. The entrance itself, behind a big green metal door with another Soviet red star on it, was also impossible to miss. You have to wait outside that door until a member of staff lets in visitors in batches. You have to get your tickets from a little booth round the corner down a narrow corridor, and then go back and wait for the tour to commence in the space between the entrance door and the access to the little corridor. That's where the guide eventually appears and starts the intro to the tour. Times & prices: Tours in English regularly take place at 1:30 p.m. daily. Apparently there's also a slightly different version at 6:30 p.m.; the former costs 2200 RUB for adults (1300 for students), the latter is a bit cheaper at 1800 RUB (1000 for students). You could also join a Russian-language tour and use an audio-guide, apparently, but I can't vouch for that being a suitable option. Nor can I say much about the various other tour options that appear to be available only in Russian, such as ones specially themed on the Cuba Crisis, or one that goes beyond the parts normally open to the public (hard hats provided) or even ones that culminate in performances of dancers and a choir. You can also arrange private tours (very expensive). Time required: The regular tours in English last about 75-80 minutes, but it's worth staying a bit longer afterwards in the bar/restaurant, so perhaps in total at least two hours (including queuing outside before the tour). Combinations with other dark destinations: in general see under Moscow. The nearest other dark site that has its own chapter here would be the Sakharov Centre, just under a mile (1.4 km) north of Taganskaya Square along the busy boulevard of ul Zemlyanoy val. Also within easy walking distance is one of the most bombastic of the Seven Sisters, namely the Embankment Building, just a short distance north along banks of the Moskva River. In the other direction, one stop on the metro line 7 (purple) gets you to Proletarskaya, from where a half-mile walk down 1-ya Dubrovskaya ulitsa takes you to the site of the Nord-Ost siege at the Dubrovka theatre in 2002, where there is a monument and a memorial plaque to the victims (see under Moscow). Combinations with non-dark destinations: To get to the heart of mainstream tourism Moscow you could even walk it – first down to the embankment and along the Moskva River all the way to the Kremlin, which is about two miles away. Otherwise get back to Taganskaya metro station from where three lines provide good onwards connections.